Today I went to Toys R Us to purchase 2 toys to donate to an organization(still looking for one). I think it’s important for every kid to have a present to wake up to on Christmas day, only because I know what it’s like to not have a Christmas(Christmas has been canceled on me TWICE when I was a kid, that’s another story though). So hopefully I’ll make two kids happy with what I got them. It was super hard looking for two toys, I kinda feel bad for parents now… It’s hard, Really! In the end, I settled for an Elmo doll and an Optimus Prime action figure. When I got home I saw that I had mail from my friend Switch. I was pretty psyched when I got this, Thanks bro! Later in the night my family and I decorated the tree, It’s kinda a family tradition of ours. Each ornament on the tree relates to us somehow, It was a fun way to gather up and enjoy each others company. 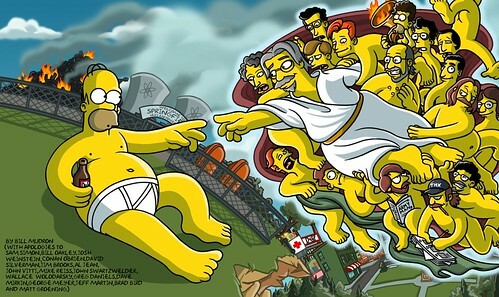 In celebration of The Simpsons’ 20th anniversary, artist Bill Mudron put together this piece. The drawing above consist of all the main writers/producers/directors. I bet you guys didn’t know that Conan O’Brien was once apart of the show way back, yup! When I entered the room, everyone was running around and prepping. I know I had to start running around soon too, just so I would fit in. My buddy Ozzie(stylist) was in the zone as well, just look at concentration on his face!! The only person who was relaxing and taking it easy was my friend Christy(model). Maybe she was getting mentally prepared for the shoot? The shoot was tons of fun. I got tons of great footage and Rony got loads of great pics. Check out more pictures after the break!!! So I’m here in the office in downtown and I was just shown this amazing video. Glad I’m not a baby, it’s hard. Check out his live performance after the jump!! !